Ken Avery begins his 17th year as Gardener. In the Newsletter, (Vol. 23 No.1 Jan 1975), Gardener Ken Avery has another update on the Great Medicine Spring just outside the Garden. 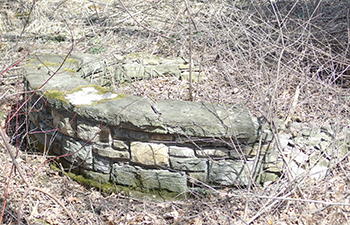 This article gives additional information and photos of the springs. It was also mentioned in the newsletter issue that Dorothy Binder, a founding member of the Friends, was now in a nursing home in Oakland California, near her daughter. The Friends held a board meeting on Jan. 20th at the home of Catherine Faragher, Gordon Morrison, Co-ordinator of Environmental Education of the Park Board and Gary Crider, Landscape Architect of the Park Board were both in attendance. The Garden did not open until mid-April due to adverse weather. The normal opening day of April 1st enjoyed a record low temperature for that date: 9 degrees F.
Ken also reported that during the winter Park Board crews were working the bog area just north of the Garden removing elms that had died of Dutch Elm Disease. Three of those were inside the Garden fence. To access this area with heavy equipment they cut a road through the boggy area where the water pipeline was that ran from the Picnic grounds through the bog and then into south Wirth. This would be the origin of the hardened gravel path that now bisects that boggy area beginning from the entrance road to the Wirth Pavilion and ending at the old paved path (the old tarvia path) that follows the back fence line of the Garden. 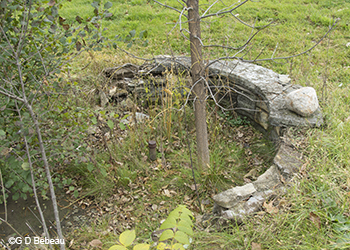 The pipeline was constructed in 1957 and ran from Bassett’s Creek to Brownie Lake and was to be used to add water to the Chain of Lakes when necessary. Pumping began immediately in 1958. X-ray image of Columbine. One of several images by Dr. Albert Richards in the Spring newsletter. Friends President Robert Dassett wrote that the Friends had given $2,000 to the Park Board for the Friends share of the cost of a new ornamental gate to the front entrance, bulletin boards, some landscaping and a railing from the parking lot to the front gate. 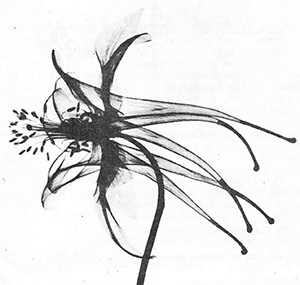 There was also an article about X-ray images of flowers that were the work of Dr. Albert Richards. 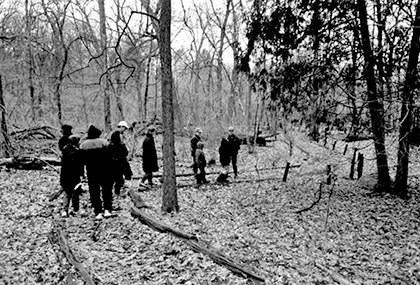 The Annual Meeting of The Friends of the Wild Flower Garden was held in the Garden, on Saturday May 17th, 1975, in the Martha Crone Shelter, 25 people attending. The morning was dark with drizzling rain, which began to clear as the meeting was ending. The handrail along the steps leading the Garden Gate. 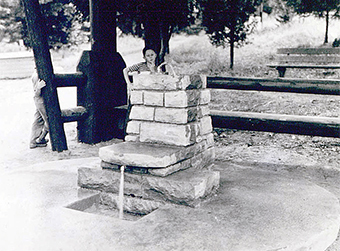 This may be the one installed in 1975. The steps shown here were installed in the Fall of 1982. President Dassett noted the Friends support for the Garden during the past year [Fiscal year ended April 30], which included the $2,000 mentioned above, plus the purchase of a chain saw, installation of lighting for the display cases in the shelter, fireplace glass doors for the shelter, repairing a projector and replacing a stolen tape deck [All except the $2,000 occurred in calendar year 1974]. Membership noted in the Secretary's report totaled 240. Friends assets totaled $3,902. Dr. Marian Grimes reported on the shelter volunteer (hosts) program with 38 people on list. Betty Bridgman, Marion Andren and Muriel Avery were the nominating committee for the Board of Directors slate. Directors elected were: Moana Beim, Jean Chamberlain, Evie Chadbourn, Alexander Dean, Robert Dassett Jr., Marie Davidson, Dr. Marian Grimes, Catherine Faragher, Bruce Hooper, Walter Lehnert, Mrs. Mildred Olson. Mr. Lehnert, who was an honorary director for the past several years, returns, replacing Wilber Tusler. Also Mildred Olson returns following an illness in 1974. Ex-officio member: Kenneth Avery. The Honorary Board Membership list this year was: Marion Cross, Dorothy Binder, Russell Bennett, Mrs. C. M. Case, Whitney Eastman, Mrs. George Ludcke, Henry Neils, Leonard Odell, Leonard Ramberg, Mrs. Clarence Tolg and the Martha Crone as honorary life member. At the Board meeting following the annual meeting, new officers elected were: Moana Beim, President; Alexander Dean, 1st Vice President; R. Bruce Hooper, 2nd Vice-president; Marie Davidson, Secretary-Treasurer. Marie Davidson also had the duties of membership and editor of The Fringed Gentian™. The Summer issue of The Fringed Gentian™ (Vol. 23 No. 3 July 1975) contained a report of the Friends Annual Meeting referenced above. Evie Chadbourn wrote about her birding trip to Morocco. John Murtfeldt, who was a nursery owner, wrote about growing wildflowers. Gardener Ken Avery wrote that the Showy Lady’s-slipper just began to bloom on June 15th. The very latest date was June 28 1945. 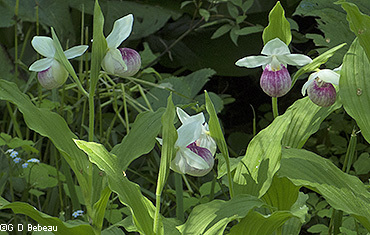 The Minneapolis Sunday Tribune Picture magazine ran an article about the Showy Lady’s-slipper and Ken was getting lots of questions about when it would bloom. The Great Medicine Spring was still running. The Friends held a board meeting on June 20 at the home of Mrs. Beim to discuss issues left over from the May 17th meeting. I was the person who developed the nice wide path that goes from the front gate down to the shelter. The way I did it was to arrange a garden hose along the route I wanted it to go. I was sure happy to get rid of that straight down plunge that used to be there. The Friends would make $1,000 available for the project. Mr. Lehnert offered to be temporary treasurer for a few months and Mr. Avery offered to put out the October newsletter with Mrs. Olson’s assistance. 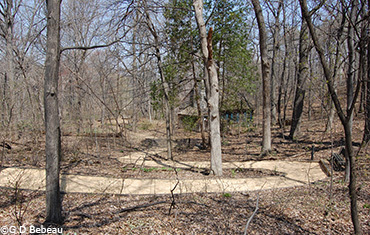 An older view of the winding path from the front gate down to the Martha Crone Shelter - probably from the 1990s as the wood edges have badly deteriorated. Note the 1917 birdbath next to the base of the twin cedars on the right edge. The present (2018) path to the shelter, following the same contour but with new wood edging and cedar shaving. 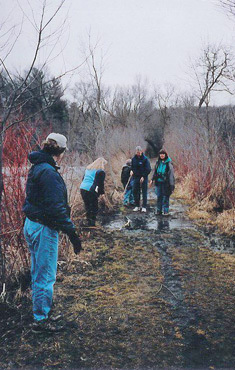 In 2000 the Friends provided funds for the edging materials. At a Friends Board meeting on Sept. 19th at the Martha Crone Shelter. Mrs. Beim brought in a picture of Mrs. Crone for the Shelter [presumably the one there now] The offer of $1,000 to help with the cost of the new path to the Shelter was declined by Superintendent Ruhe as he felt the paths in the Garden should be the Park Board’s responsibility. 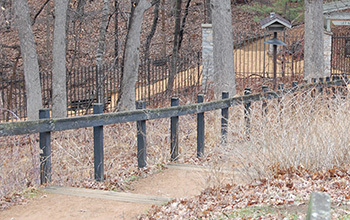 Mr. Morrison noted that two to five benches would be installed along the new path also. Although Mrs. Beim had spent considerable time over the past two years researching alarm systems for the Shelter and then recommending one at this meeting, the board voted to add an insurance rider for the Shelter contents to the Park Board’s insurance policy covering the shelter and to do nothing on an alarm system. [Note - years later an alarm system would be installed.] An inventory of shelter contents taken on October 20th totaled $3,320 of value.